When Sure heard about my busy last month they offered to help stamp out the stress and get me through the day stress and sweat free. That day I had to attend my boyfriends graduation and then get on a plane to Lisbon before hopefully making my next plane which left only 45 minutes after. They kindly sent me a kit to get through the day which really helped keep me organised, on time, looking presentable and sweat free. The travel wallet helped keep all my tickets organised both for the plane and the graduation. We were short on time all day therefore the DKNY watch helped keep us on time and I managed to get everywhere on time. The Benefit Primping with the Stars kit was also ideal as the primer and powder all helped my makeup last all day and the size meant I could take them on the plane. Surprisingly the item that came in the most use was the Cath Kidston bag, it has two size bags; a small clutch like one and a larger holdall which I have used both at the airport and even now on holiday- I can’t believe I didn’t have one before! Along with taking the stress out of my bust day they kindly also send me a Sure Maximum Protection deodorant in the new stress control variant. 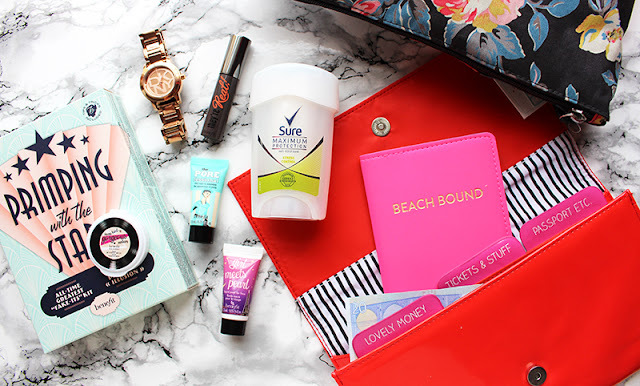 I’ve used the Sure Maximum Protection deodorant in the past but the new Stress control formula has a really calming lavender and white flower scent, extra moisturisers to help prevent skin irritation as well as twice the protection of the best selling antiperspirants.